A great birthday party does not have to break the bank. Following a brief absence, I'm delighted to say we have handmade fabric party bunting back on the site. Of the finest quality, fabric backed and made to order, they are a very a very welcome addition to our product range. The personalised bunting comes in a range of themes, including girlie pink, boyish blue, football, pirate and a cute nautical theme featuring a little tug-boat! They measure approximately 3 metres in length and can have a name of up to 10 letters. The "happy birthday" party bunting is approximately 2.6 metres in length and comes in girlie pink, boyish blue and funky colours. All of these banners and bunting sets will give a touch of elegance to any party setting, be it in a hall or a room in your house, or in the garden. As they are fabric, they can be used time and time again, so they are both economical and environmentally friendly! Do you need ideas for party games? Out of all the questions I hear parents asking about their kids' birthday parties, either at the school gates or on internet forums, is "how can I keep a group of kids occupied for an hour?" We all know the popular, traditional games such as musical statues, bumps or chairs, and pass-the-parcel, but if you are seeking inspiration for something a little bit more exciting, then take a look at our party games ideas pages. We have tons of games ideas, including some we think you might not have heard of before! If you have a great party game of your own to share, then why not enter our competition? You could win a 20-track party music CD and £10.00 to spend at Funky Dory Party Bags! Children enjoy playing make believe games because it allows them to think of worlds other than what they are used to and expand them as they wish. Make believe activities are a good way of exercising their creative faculties and allowing them to maximize their capacities for creation, discovery and foresight. It is, therefore, for this reason that themed birthday parties are a hit among children. It doesn''t matter what kind of party you''re intending to throw. Any children''s party may be celebrated with a theme. In fact, you don''t really need to have a particular occasion to be able to host a themed party, or any party, for that matter. If it''s your child''s enjoyment that''s on your mind, you can have a themed party every day for the rest of month, if your budget and energies permit it. Themes are not exactly gender exclusive. 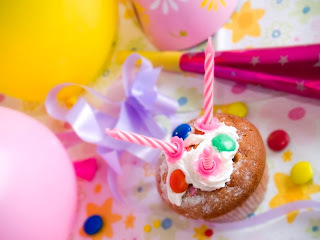 However, there are certain children''s birthday party themes that fit girls only or boys only. For example, fairy themes, luaus, Disney princess themes and sweet sixteens are exclusively for girls. On the other hand, sports themes, pirates, cars, medieval knights and aliens are usually for boys. Other interesting children''s birthday party themes include slumber sleepover, tropical outdoors, under the sea, indian themes, cowboys, character-centric themes (Spongebob Squarepants, Blues Clues, Kim Possible, etc), outer space, farm animal themes, Star Wars, and others. You can mix and match popular themes of you want. For a themed party to be successful, the kinds of food you serve, the games you play and the favors you give out should be consistent with your theme. Hence, if you''ve decided on a fairy princess party, your food should include things like dainty-looking cupcakes and shimmery food coloring in pastel colors, and your giveaway bags should have princess prints on them. The same goes for cowboy themes. You can ask your guests to wear costumes that coincide with your chosen theme to make the event more interesting. If you''re not really into costumes and find preparing for this a little tedious, you can ask your guests to bring something or wear something that would reflect the theme. As the host of the party, of course, your child should be in costume. It''s his day, after all, and you want to make the pictures stand out and be memorable. Your baby celebates his or her birthday only once a year, so why not go all out and make this extra special? Article written and entirely owned by Low Jeremy who maintains http://Child-Party.ArticlesForReprint.com. We're running a special offer until the end of March. Our next day courier delivery, normally £9.99 is now only £6.95! This offer is valid for orders placed before 1pm and subject to stock availability. Calling all budding costume designers! Our friends at Blush Fashions have launched a fantastic new competition! They need all you children out there, boys and girls, to get your paper, pens, paints or whatever else you would like to use and design your very own dressing up costume! Judges will be looking for imaginative and creative designs. Blush,1 Albemarle Street ,South Shields, NE33 1LZ. To give all you budding designers plenty of time to design your creation the closing date will not be until 30th April 2009.Shortlisted entries will appear in a special gallery shortly after the closing date.For the best bit though, the PRIZE!!!!! £50 worth of vouchers to spend on Blushfashions for the winner and two runner up prizes of £20 vouchers each also.Ready ,Steady, ..........................................go!!!! Do you invite the whole class to the birthday party? I've just been reading an interesting feature on Times Online, by Sarah Ebner, and thought it's probably a question many parents of primary-aged children (myself included) have asked themselves! Do you invite the whole class to your child's birthday party? These days children's parties can be almost obscenely expensive. Jane has contacted me to say that she actually feels ashamed of how much she just spent - on a party for a six year old. "I have previously shared and/or done the entertainment myself so it was quite a shock to the system," she writes. "I kind of feel it’s morally wrong to spend that much, but with a small house and a winter-born child, if you want to invite the whole class it is never going to be less than £300…"
Some of you might shudder at that thought, but, particularly if you're in London, I don't think this will be news to you. Parties are ridiculously expensive and part of that is probably down to raised expectations among the kids: they want "entertainers" who charge anything from £100 upwards for an hour of "fun". But space is also a factor, and this has to, at least partly, be down to the "invite the whole class" mentality. Most state schools have 30 children in a class. It's not easy to fit that many children into your house - and that's without worrying about mess and breakages! We had 20 pre-schoolers in our house last year for my son's 3rd birthday. It was great, but a ridiculous squash. Thirty would have been out of the question. I sense that this may only be a problem in the early years of primary school. 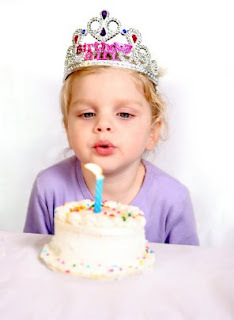 As children grow older, many don't want to invite everyone (my daughter had girls only at her 7th party), but when they are 4, 5 or 6, it seems to be expected. Maybe starting school means signing up to a kind of unwritten code that every child - however nice they are, or however friendly they are with your offspring - should be asked to come along. Then, of course, keeping them all occupied is a huge job too! To be honest, the primary school party world is a bit of a nightmare. It can be like a military operation, sorting out venue, entertainment, food and going home presents. And that's without keeping an eye on all the children (and when they're young, often the parents too!) Note that I haven't even mentioned presents - that's a whole other can of worms, and possibly one for another day. In the meantime, I'd be interested in knowing what happens at your school. Do you invite the whole class or have you been brave enough to put down a limit? You can see the article, along with the many interesting responses to it here. If you do feel brave enough to invite around 30 children to your house or party venue, then the party bags needn't cost you a fortune. Most filled party bags at Funky Dory Party Bags are very reasonably priced at between £1.00 and £1.50. Or if you prefer, you could give each child a really special gift on the way out, such as our animal mugs, which are very reasonably priced at just £1.00 each, or £1.99 each for the larger, puzzle mugs. Competition - send us your top party tips! To celebrate the launch of our new 20-track Party Music CD, we are giving away 5 copies of the CD, as well as one £10.00 gift voucher to spend on the website. The CD features 20 superb quality cover versions of party favourites old and new, including Shine, Reach, Hey Baby, Get The Party Started, It's Chico Time, plus many more. To see a full playlist, please click on the link which will open in a new window - Party Music CD. For a chance to win one of these five CDs, all you have to do is give us your top children's party tips! Do you know the best party game, or have a great group craft activity? Or perhaps you have a fantastic party food recipe suitable for guests with food allergies? How about some great money-saving ideas for those on a budget, or some fab eco-friendly ideas? Whatever your top tip, we want to know about it. The 5 winners will be those that we judge to be the best tips, so tr y and be as original and creative as possible. The 5 winners will each receive a copy of the Party CD, and the entry that we judge to be the best overall, out of these final 5, will also receive a £10.00 gift voucher to spend at Funky Dory Party Bags. Be aware that all party tips received as entries may be published on the Funky Dory Party Bags website, Funky Dory World Blog, or in articles produced by Funky Dory Party Bags. You can see full competition rules on our competition page. Primary Times is a free magazine distributed to primary school children throughout the country. It contains articles for parents, as well as local information and "what's on" guides. 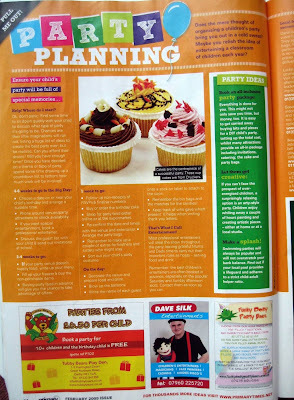 I'm delighted to say that Funky Dory Party Bags are in the February half-term 2009 Derbyshire issue! This issue contains a 2 page pull-out feature on Party Planning. There are party ideas for parents as well as a step-by-step party planner. There is some editorial on Funky Dory Party Bags, and our advert can be found on the bottom right of the left-hand page. I'm hoping it will bring lots of local interest (particularly as the advert contains a 10% discount code, to ease the burden during the current economic climate). I do question the wisdom of giving the magazines directly to the kids though, having just witnessed at least half-a-dozen pupils chasing down the street with their copies rolled up tightly and being used to bash each other over the head! Got to love 'em though, haven't you? Whilst Funky Dory Party Bags' speciality is filled party bags and mugs, we appreciate that customers are often looking for more than just those items when they are shopping with us. With this in mind, we occasionally branch out into other areas and are slowly and surely expanding our range of party products. We are really pleased by the positive reception the Funky Dory Birthday Party CD's have received, and have just added lots of lovely balloons and banners to the Party Supplies section. The latex balloons are available in number of colours and are of very high quality. They are 11 inch diameter, and very strong and supple, meaning they can be used for games and decorations and will not burst very easily! 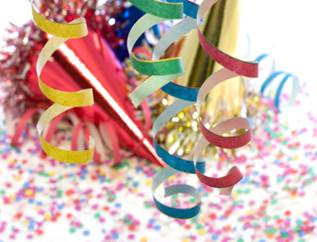 The 9ft party banners are in plastic and in various bright, appealing colours - they feature the messages "happy birthday", "the party's here" and "birthday boy or girl". Each design is repeated 3 times, so the banners can be used as one long party decoration or divided into 3 equal sections. We also have some lovely bright Happy Birthday Bunting, which measures a whopping 3.6 metres in length (approx). 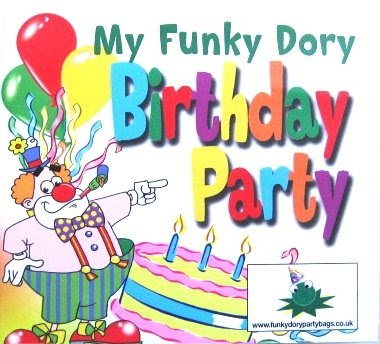 I'm pleased to announce our brand new product, the "Funky Dory Birthday Party" 20 -track CD. Produced for Funky Dory Party Bags by the Music Factory, the sound quality is superb, and it features 20 cover versions of party music favourites, old and new. We're sure it will get your party off to a great start, and will provide great value entertainment for dancing and party games. The tracks include real favourites such as "Shine", "Reach" and "I Like To Move It", and many more. We're always looking at ways to make things easier for our customers, and with that in mind, we've added a new payment option to the existing online and telephone methods. You can now order your goods online, and pay for them offline! All you need to do is place your order as usual, choose the "Pay Offline" payment option, print out your barcoded invoice (or just write down the barcode number), and take this to your local Post Office or PayZone outlet and pay with cash or debit card. 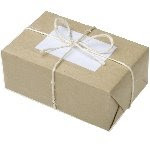 Your goods will then be despatched in the usual way by Funky Dory Party Bags.